Based in London, Jonathan Anderson and Edwin Low have been collaborating as “Anderson & Low” since 1990. Their photographic work includes portraiture, architectural studies, abstract images, reportage, nudes, and landscape and is noted for attention to concept, form, lighting, and printing. Their photographs are exhibited internationally, and are included in many public and private collections including: The Metropolitan Museum of Art, New York, Victoria & Albert Museum, London, National Portrait Galleries of both the UK and Australia, Museum of Fine Art, Houston, High Museum of Art, Baltimore Art Museum, Atlanta, National Gallery of Australia, Akron Museum, The National Gallery of Australia, the Southeast Photography Museum, Florida, and Museet Fotokunst, Denmark, the US Olympic Center, and the Colorado Springs Fine Arts Center. Their Athlete/Warrior photographs were exhibited at the Fine Arts Center in 2005. 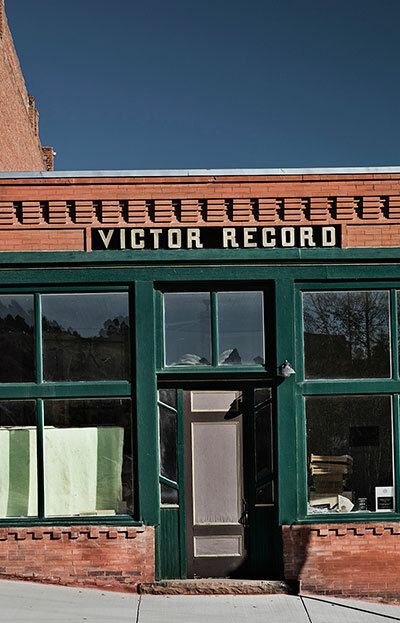 Jonathan Anderson and Edwin Low describe the sense of wonder that the Colorado town of Victor – the City of Mines – has instilled in them over many years of visiting and photographing this place. The artists have elegantly stated that Victor “hypnotized us and really got under our skin; it is a place to which the Colorado winds always seem to blow us back.” They have articulated a similarly poetic expression in both the visual language and subjects of the photographs that comprise their City of Mines project. As with their previous bodies of work, the visual language employed by Anderson & Low in City of Mines is direct yet eloquent. Their choice of medium as well as dominant visual threads reiterate Victor’s “hypnotic” power for the artists. While Anderson & Low have worked effectively in both black-and-white and color, the latter form was an important choice as it communicates necessary moments of human warmth, life, and resilience in an overwhelmingly tough and uncompromising environment. The artists also clearly have an affinity for the proliferation of commercial text in Victor. The text becomes a significant component of our engagement with the images, reminding us of photography’s unique capacity for simultaneous graphic clarity and metaphoric suggestion. Although metaphor may not be a dominant motivation behind Anderson & Low’s City of Mines work, its subtle voice indeed emerges in the seasonal whispers of autumn and spring. As we advance though this body of work, the interplay of snowy and windswept bleakness with hints of green renewal may suggest, or at least reiterate, Victor’s cycles of advance and decline. The images weave back-and-forth from expansive landscapes to intimate interiors. Although the subjects are primarily architectural, these historic structures speak of autographic assertion imprinted for over a century. This is the work of permanent and temporary residents, unseen in the photographs, but recorded nonetheless in delightfully accented domestic and commercial spaces. We also witness the hand of those residents in the ravaged mountainsides occupying the background in some of Anderson & Low’s photographs. This is the trace of industrial mining activity from which this town blossomed and withered, yet the artists do not dwell on it and trust us to apprehend that tough history while celebrating the persistence of life in this place. Colorado’s history as a state has spanned a similar duration to that of photography as a visual and conceptual medium. Adventurous and passionate photographic documentarians and artists alike have intensively represented the diverse landscape, its people, and the ideas that have defined Colorado and its pivotal role in the continuing story of America, from the Manifest Destiny gloriously represented in 19th century photographs by William Henry Jackson to its late-20th century realization heartbreakingly realized in Robert Adams’s images. With City of Mines, Anderson & Low’s work will now be inextricably connected to this Rocky Mountain history and the photographs depicting and representing it. Documentation of the “rise and fall” of American towns and the impact on people is a long tradition that goes back to the dust bowl, Dorothea Lange, Walker Evans, etc., and of course numerous recent projects too, in Detroit and elsewhere. But we feel that there is considerable difference in our project from much of the very recent focus on urban decay (which has been continuous since the credit crunch), and which sets it apart from the “typical” project that many photographers have undertaken in recent years: the timescale and character Victor is quite untypical of most recent projects, which have concentrated very much on the effect of the recession in larger urban conurbations – cities like Detroit, most of which have shown only more recent decline, have been the focus of much attention. Also, the very specific origin and date of its rise (gold mining), and location of Victor (Colorado Mountains) results in very specific and individual character and visual language – something that is quite hard to define: the 1890s gold rush buildings are there, but there is something else as well: Part “The Waltons”, and a little bit of the “Twilight Zone” too, plus something else very specific to the area. So the project is in a sense less about the decay of the city than about its personality, for which we have developed such affection. We cannot really explain why Victor attracted us so much – it is a ramshackle place in some ways, but with a quirky and beautiful individuality that is all its own. It is a town filled with contradictions – it has few pretensions of elegance, yet somehow there IS elegance in its individual, stark reality. Some of the buildings have fallen apart completely, yet others have been beautifully restored (and not just “prettified”), retaining their original spirit and character. Much of there is very old – and much of what is modern there is a little strange and has elements that are bizarre. But the town feels less much like a mere piece of “21st century eccentricity” and more like some hidden, forgotten place that time passed by, or more accurately a place that time has “re-curated” into a unique style. “Victor, Colorado sits high atop the Rocky Mountains, at an elevation of some 10,000 feet. While the thin air, and hot, close sunshine are frequent reminders of just how far “away” this place is, a better illustration of the distance between Victor and the rest of the world is the town itself. A picture of both historical decay and contemporary quirkiness, Victor is the kind of place that fascinates those who seek to reconcile dichotomies. Anderson & Low have peered inside the layers of meaning upon which Victor has been built, one abandoned building or bar room decoration at a time. Once a boomtown and the centre of the Colorado gold rush, Victor grew up quickly. Once the veins of precious metal were tapped out, the town emptied nearly as fast. Today, it feels like a community surrounded by the bones of the past (and not just because of all the fun the town seems to have with skeletons around Halloween).